Ann Arbor, MI 48109-1005, U.S.A.
Ben van der Pluijm is the BR Clark Collegiate Professor of Geology and holds appointments in Earth & Environmental Sciences and Program in the Environment at the University of Michigan. His research area is Structural Geology, dealing with the deformation of Earth’s crust from microscope to mountain belt, and from past to future. His second area of interest is Societal Resilience, examining the connections between human society, Earth resources and natural hazards. He is Editor-in-Chief of AGU's journal Earth's Future. A transdisciplinary, open-access science journal, Earth's Future examines the state of the planet and its inhabitants, and the predictions of its future. The journal assesses the challenges and opportunities associated with regional and global change in an era where humans dominate Earth’s environment, resources and ecosystems. It publishes peer-reviewed articles, reviews and (short and long-form) commentaries in areas that include water, air, food, energy, hazards, climate, ecosystems, human health and demographics, among others. Contributions focus on Earth as an interconnected, evolving system to inform researchers, policy makers and the public on the science of the Anthropocene. He has authored more than 200 peer-reviewed articles, edited several book volumes and published the undergraduate textbooks "Earth Structure" and "Processes in Structural Geology and Tectonics". Educational and public activities include learning technologies and lectures on geology, geohazards and global change. The surface of Earth is shaking all the time in response to natural events, close and far away, and from nearby human activity. Sometimes this shaking is violent and damaging, such as from large earthquakes, volcanic eruptions or nuclear explosions; other times shaking is much less, such as landfall of big storms or controlled mining explosions. 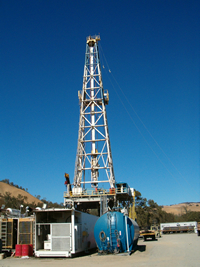 The source of Earth shaking produces characteristic patterns of vibrations that a digital seismometer records. Earthquakes, explosions, storms, building collapse, traffic all create different patterns. 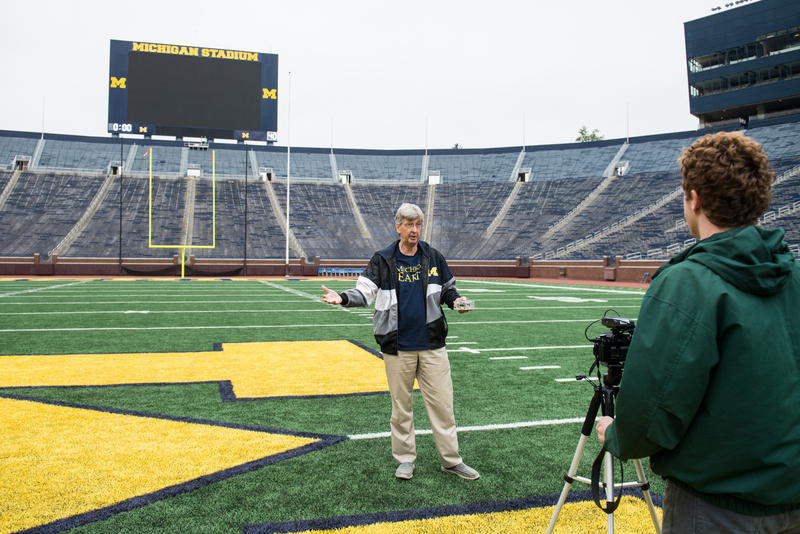 The Michigan Shake project focuses on local shaking from human activity by recording audience response to game moments in the largest football stadium in the nation: the Michigan Stadium. This local seismic signal is irregular and protracted, with ups and downs, unlike sudden energy releases from an explosion or more steady city noise. The audience energy is small compared to earthquakes, perhaps less than Magnitude 1 on the seismic magnitude scale, but enough to shake the stadium and its occupants. Specific game events, like touchdowns (TDquakes) and band play are easily recognizable, while shaking from the visiting team's TD is much less impressive. Because the seismometer is not calibrated for its specific location (surprisingly, test explosions were not approved by facilities staff), we use the Michigan Magnitude (Mum), which is the 10log value of maximum shaking (maximum count). Whether Mum will become a global standard depends on the team's season. Resilience = Prepare + Absorb + Recover + Adapt. Earth Structure - An Introduction to Structural	Geology	and	Tectonics (2nd edition). The Second Edition of Earth Structure: An Introduction to Structural Geology and Tectonics takes a balanced approach to the subject area―emphasizing links between structural features at all scales (microscopic, hand-specimen, outcrop, mountain-range) and deformation processes. Earth Structure also shows how assemblages of structures relate to different geological settings in the context of plate tectonics. Chapters are self-contained modules that can be arranged in various sequences depending on instructor preference. The book uses a conversational writing style, employing familiar analogies and field examples; mathematical analysis, where used, is kept at the trigonometry level. Ben van der Pluijm and collaborators are continuing their research on orogenic geofluid sources and timing, focusing on the US and Canadian Rockies and the US Appalachians. Colleagues in Europe provide facilities that are optimized for mass spectrometry of clays, while UM’s Ar geochronology lab dates and quantitative XRD measurements complement these O-H data. This summer, Erin Lynch completed her PhD on orogenic fluid fingerprinting and now shares her talents at Shell, following an academia-to-industry path of many of his recent PhD students. Disappointed by the lack of solid Earth events in Michigan (good news for everyone else), Ben decided to ask 100,000+ people in Ann Arbor’s Big House to help create shake signals for use in his new Intro Geology class (E119, “Earth Interactions”). A piece on his Michigan Shake project is elsewhere in this issue, and the website at https://ben.earth.lsa.umich.edu/seismo/michiganshake.html has details, results and some write-ups. 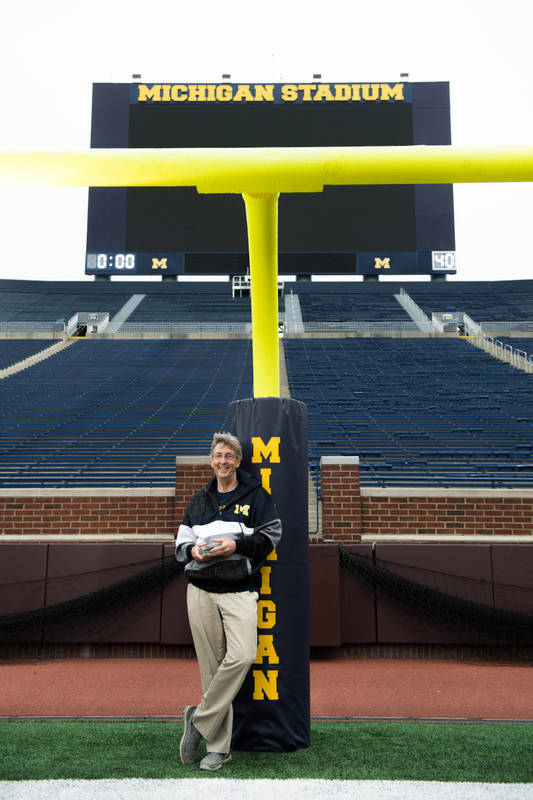 As a reward, Ben got the Michigan Stadium to himself to punt some seismometers (photo). The 2016/17 academic year was an exciting time for Ben van der Pluijm with the successful completion of two PhD theses. Samantha Nemkin, in a project with Rob Van der Voo, finalized her research on synfolding remagnetization, showing this is very common in the Rocky Mountains and its equivalent in Mexico. A third paper, on the Monterrey orocline in northern Mexico, was just accepted for publication. Austin Boles completed his studies on clays in a range of deformation settings, and the development of a more advanced X-ray clay characterization method. Beyond published work, a couple of papers remain under review, including results from surface outcrop analysis along New Zealand’s Alpine Fault and Rietveld quantification of clays. The continuing research of graduate student Erin Lynch focuses on geofluid fingerprinting in the Rockies and Appalachians, building on a recently published study in the Argentine Precordillera that finds a regional climate signal in fault rocks. She enters her final year with a Rackham Predoctoral Award, allowing uninterrupted time to complete and defend her dissertation in mid-2018. Ben has expanded his professional efforts and outreach activities in societal resilience, which is the focus of a Fall class and will be incorporated in future teaching of intro geology. An optimistic presentation on “The Human Era: Living in the Anthropocene” was offered in several professional and public venues, including an U-M alumni trip in sunny (!) SE Alaska (picture). The AGU journal Earth’s Future, dealing with the science of the Anthropocene, continues to grow and seems well-received by colleagues (if journal impact factors mean anything) and the public (based on Altmetics). Some personal travel, meetings and service trips, and a new puppy, Luca, keep Ben and Lies nicely occupied. Their sons, Wouter and Robert, decided to support Delta Airlines by moving to Boston and San Francisco for their work. The goal of last year’s Paris accord to limit global warming to 2°C (=3.6°F), if not 1.5°C (=2.7°F), is admirable, but it’s unlikely that these aspirational goals can be reached with voluntary greenhouse gas emission reductions alone. Already, we are nearing the 1.5°C global warming level, with predictions for reaching 2°C not far into the future. The implications of global warming are recognized widely, both in short-term events like coastal inundation and extreme weather, and long-term in the form of permanently shifting climate zones and higher sea level. The range of our actions, however, is not limited to greenhouse gas generation only. Building on humanity's remarkable history of engineering approaches to overcome challenges--from early use of fire to create stronger tools, to modern manufacturing and construction-- climate engineering techniques should be included as viable solutions for reducing the impacts of global warming. Ben van der Pluijm usually writes about geo research or teaching in his annual update for the departmental newsletter, but he has a parallel interest area in sustainability and resilience. Since 2014 he has been editor-in-chief of the AGU’s fledgling journal Earth’s Future (see cover image). A transdisciplinary, open-access science journal, Earth's Future examines the state of the planet and its inhabitants, and the predictions of our collective future. The journal assesses the challenges and opportunities associated with regional and global change in an era where humans dominate Earth’s environment, resources and ecosystems. It publishes peer-reviewed articles, reviews and (short and long-form) commentaries in areas that include water, air, food, energy, hazards, climate, ecosystems, human well-being and demographics, among others. 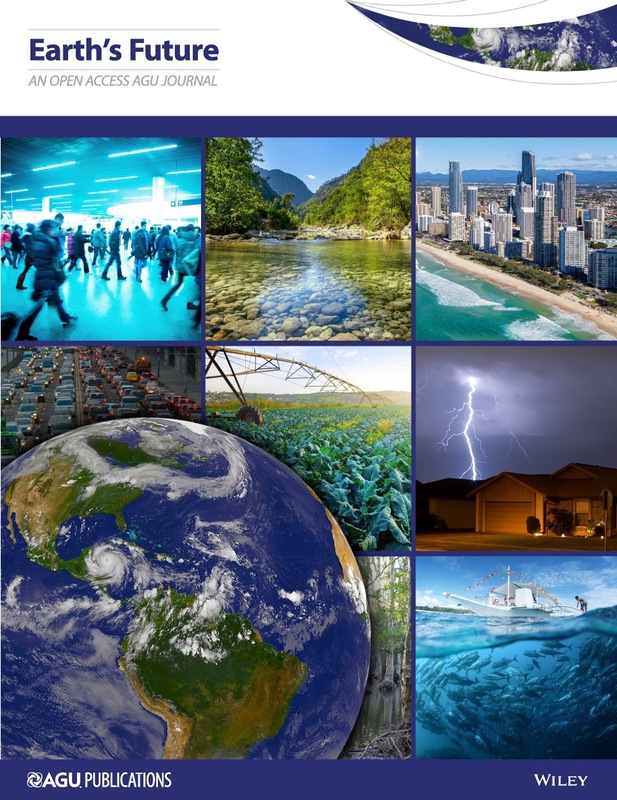 Contributions focus on Earth as an interconnected, evolving system to inform researchers, policy makers and the public on the science of the Anthropocene. One novel element is the use of authoritative commentaries that critically examine a topic with a solid scientific foundation. 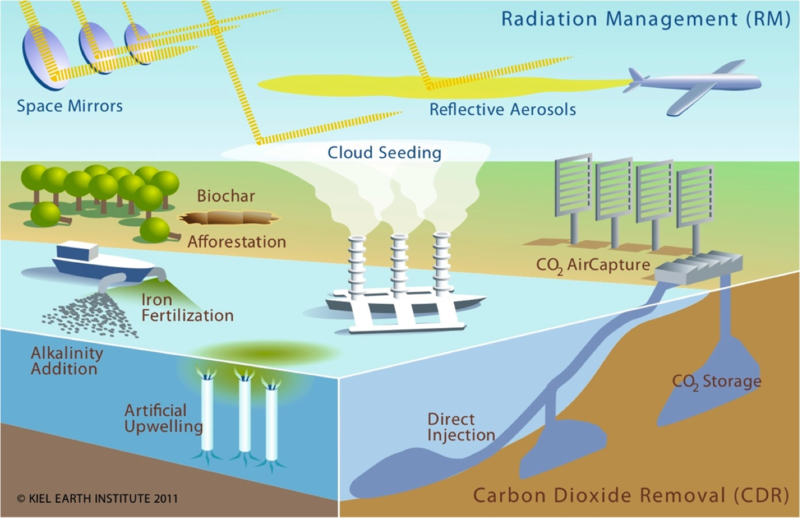 For example, one such set is just published on the controversial topic of climate engineering. Those interested in the yes/no debate about an Anthropocene Epoch will find key papers here too, with a couple of examples recently highlighted in my Editors’ Vox on this topic (Here comes the Anthropocene; https://eos.org/editors-vox/here-comes-the-anthropocene). You can have a fully open-access look at the journal, at http://agupubs.onlinelibrary.wiley.com/agu/journal/10.1002/(ISSN)2328-4277/, where you will likely find stimulating and informative contributions on our (=Earth’s) Future. Ben van der Pluijm ended a nearly 15 year stint as director of the Global Change Program, which offered a set of introductory courses on planetary stewardship and sustainability, and (College of LSA’s first) minor degree. The inception of this educational program was funded by generous support of the Hewlett Foundation and the U-M’s Provost Office, in collaboration with Tim Killeen and other U-M colleagues. The GC Program was absorbed by PitE’s growing minor offerings. Ben is now developing a new approach that focuses on societal resilience (Earth/Environ259), moving from the aspirations of sustainability to the practicalities of a changing environment. Over the summer, Ben also worked on a new version of the successful Earth Structure textbook, which changed so much that a new title will be used. “Processes in Structural Geology and Tectonics” reorganizes the standard structure course outline, by integrating observation, theory and process, without losing sight of fundamentals. The primary goal of this new approach is to improve students’ understanding and retention of key elements and processes in this area of study. An experiment with online posting is underway, allowing greater international access and lower prices (see earthstructureweb on Facebook). Graduate student Austin Boles continues the development of H analysis as a proxy of fluid sources, most recently on samples from the Alpine Fault of New Zealand. Erin Lynch is similarly working on sources and timing of fluid history, focusing her efforts on the Cordilleran fold-thrust belts of S and N America. Samantha Nemkin, jointly supervised with Rob van der Voo, continues her work on the timing of remagnetization using the paleomagnetic fold test in limestones and fold dating of interbedded shales. Several undergraduate students are also involved in these projects. Various projects with recent group members Anja Schleicher (GFZ Potsdam) and Elisa Fitz-Diaz (UNAM) are continuing as well. A project on dating deformation in the Canadian Rockies that started well over a decade ago with PDF Peter Vrolijk (van der Pluijm et al., Nature, 2001), culminated in a regional study and synthesis of the Alberta Rockies that emphasizes the importance of short deformation pulses instead of long-lasting, continuous deformation (Pana and van der Pluijm, GSAB, 2015). These views are not embraced by everyone. Ben and Lies continue to host U-M alumni travel, most recently to the Barents and White seas, visiting Russian harbor cities like Murmansk and Arkhangelsk (picture), seeing samples from the bottom of the Kola Peninsula deep hole (12 km! ), and foggy Nordkapp and Tromsø in Norway, all of which with 24 hr daylight. Lastly, an upcoming GSA-Baltimore set of sessions organized by PhD grads Sam Haines, Bernie Housen, Eric Tohver and Arlo Weil will celebrate Ben’s 30 years of research and graduate mentoring at Michigan, and, gasp, his 60th birthday. In late 2013, Ben van der Pluijm accepted the invitation of the American Geophysical Union to become Editor-in-Chief of its new journal Earth’s Future. The journal examines the human interactions with our planet and the predictions of its future (“Earth's Future: Navigating the Science of the Anthropocene”; http://goo.gl/2DbAM4). Besides supporting AGU’s mission to promote discovery in Earth and Space Sciences for the benefit of humanity, Earth’s Future offers free access to its publications. Tracking the journal’s use demonstrates the impact and unrivaled reach of open-access publishing, with users around the world and notably greater participation from less-traditional regions in Africa and Asia. Ben capitalizes on his experiences in education and outreach in sustainability science for this role, but has also not forgotten structural geology. Beautiful (and Ar-dated) fold train in the southern Sierra Madre Oriental, Mexico. A new direction in his research program is the examination (“fingerprinting”) of geofluids that were involved in upper crustal deformation. Third year PhD student Austin Boles work on rocks from northern Turkey and newly-drilled samples from New Zealand’s Alpine Fault to understand the fluid history in continental transforms. Second year PhD student Erin Lynch studies the timing and sources of fluids in the Argentinian Cordillera, north of Mendoza (yes, excellent Malbecs). Third year PhD student Samantha Nemkin’s research capitalizes on recent fold dating successes by examining the timing of remagnetization and oroclinal bending in northern Mexico, in association with U-M’s Rob Van der Voo. Collaborations with research scientist Anja Schleicher (Japan’s Nankai subduction zone) and recent PDF Elisa Fitz-Diaz (Mexico’s Sierra Madre Oriental) continue to bear fruits too. Ben is also using his new-found freedom from admin roles for overdue visits to colleagues and places (see picture), and served as 2013/14 Earthscope lecturer (http://goo.gl/Ttx402). 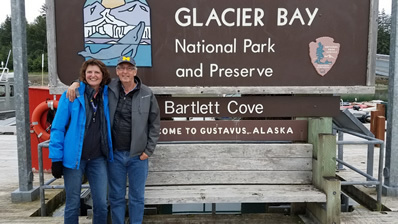 He continues as faculty host on U-M alumni tours, most recently to Greenland and next year to Russia’s White Sea region. A return to teaching structure (using, surprisingly?, the textbook Earth Structure) and new approaches to sustainability education mark Ben’s recent teaching efforts, which he plans to continue. Highlighting some research outcomes, Ben finally completed a major paper on orogenic pulses that is based on work in the Rockies (GSAB, 2014), and an armchair view (the reviewer’s take) on the Anthropocene (“Hello Anthropocene, Goodbye Holocene”; http://goo.gl/g2sXjb). Understanding and managing our new and future relation with the Earth requires research and knowledge spanning diverse fields. Earth’s Future will explore and foster interactions among the Earth and environmental sciences, ecology, economics, the health and social sciences, and more. Its mission is to focus on the Earth as an interactive, evolving system to help researchers, policy makers and the public navigate the science. During the last decades, decision-makers in public service and private sectors have increasingly realized that the major challenges facing human society in the 21st century will be related to the evolution of the Earth system. Among the global challenges are the limitation of available natural resources, the rapid population growth and its concentration in large urban areas, climate change with its impacts on the environment and society, the human and economic impacts of hazards such as earthquakes and extreme weather, air and water quality, sea-level rise, reduction in biodiversity, etc. International organizations, national, regional and local government, and private corporations will have to address these issues and, specifically, find appropriate approaches, such as fundamentally modify our energy supply system, preserve the biosphere from anticipated degradations, adapt to unavoidable effects of climate change and geohazards, provide sufficient and healthy food as well as clean water, improve access to education, medical and welfare services, and ultimately improve the level of human well-being and development of the world’s population. All such decisions will have to be based on scientific knowledge and understanding of the governing processes. It is, therefore, the responsibility of the scientific community to develop programs that will help society address these key challenges in the decades ahead. Many of the questions posed by stakeholders require interdisciplinary approaches. They will not be left to individual scientists nor even to scientific teams, but will often require a close dialogue with various players in society and the co-production of knowledge involving different partners. Disciplinary science will remain extremely important to build the pillars of the “science temple”, but at the same time, there will be a need to develop more holistic approaches that will integrate knowledge from individual disciplines and produce the roof of this temple. About two years ago, the American Geophysical Union constituted a task force to assess new journal concepts for the Union. The task force noted that the scientific landscape has been evolving toward more integrated, transdisciplinary science and toward more societally relevant research that is geared toward solutions to coupled human and planetary challenges. The task force noted that AGU has produced many successful journals in the past decades that cover a large spectrum of geophysical disciplines, but that there is a recognized need to better link these disciplines with, when appropriate, economic and social processes. We are pleased to introduce the first issue of Earth’s Future, the new AGU journal that aims to address these issues and should become a primary tool for lively dialogue between a large multidisciplinary research community and stakeholders representing a broad spectrum of societal sectors. Earth’s Future deals with the state of the planet and its expected evolution. It publishes papers that emphasize the Earth as an interactive system under the influence of the human enterprise. It provides science-based knowledge on risks and opportunities related with environmental changes. Earth’s Future is a transdisciplinary, open-access journal that is published electronically. The journal will include regular research papers, review papers, commentaries and essays in support of its stated goals. The journal has been launched by one of us (GPB) who acted as Founding Editor-in-Chief for the initial period of its existence and worked closely with Associate Editors Michael Ellis and Anthony Del Genio. A permanent editorial team led by the new Editor-in-Chief (BvdP) is being constituted and will assume responsibility for future issues of the journal. Both of us would like to thank all the colleagues and the AGU staff members who have contributed to the launch of Earth’s Future and have steadied the first steps of this new journal. We look forward to an exciting (Earth’s) future. Ben van der Pluijm recently returned from a year at the National Science Foundation, where he helped shape the foundation’s sustainability portfolio of programs (“SEES”); see a short write-up on his experiences elsewhere (vanderBLOG). Meanwhile, Ben was able to remain actively engaged in research through the efforts of a group of wonderful students and colleagues. Several publications on aspects of SW US detachment fault systems appeared with PDF Charlie Verdel, who is now lecturer at Univ of Queensland, Australia. Graduate student Tim O’Brien focused on pseudotachylyte dating, which resulted in the first direct age of faulting associated with Iapetus opening. Research scientist Anja Schleicher published our final(?) publication in a set of original research papers on the San Andreas Fault drilling project. Our collective efforts in this project convincingly confirm the starting working hypothesis of clay minerals as the mechanical agent responsible for weak fault, creeping behavior; Ben wrote a short note for Nature Geoscience on this after friction experiments in competing labs demonstrated that SAFOD swelling clays are also very weak in laboratory settings (read here). Post-doc Elisa Fitz-Diaz joined the group last year tackling the high-risk, high-reward project of fold dating. Ar dating of folds would complement our now-established fault dating capabilities, allowing detailed spatio-temporal information along and across fold-thrust belts. The preliminary results are very promising, so stay tuned. Three new students will be joining us this Fall. Austin Boles will examine the fluid history of fault systems using high-resolution O-H isotopic analysis of newly mineralized clays in collaboration with colleagues at Wisconsin and Frankfurt. Initial sampling work was done by Ben in summer 2011; see spectacular exposure of the North Anatolian Fault in Turkey in the picture. Samantha Nemkin will work with Rob van der Voo, Elisa and Ben on nature and timing of orogenic curvature in Mexico, while Vera Hehn will work with Eric Hetland and Ben on microseismicity potential and shale properties associated with hydraulic fracturing in the eastern US. A Focus on Science, Engineering and Education for Sustainability. In a sustainable world, human needs would be met without chronic harm to the environment and without sacrificing the ability of future generations to meet their needs. Addressing the grand challenge of sustainability, the U.S. National Science Foundation (NSF) has developed a coordinated research and education framework, called the Science, Engineering, and Education for Sustainability (SEES) portfolio (http://www .nsf .gov/sees). The growing family of SEES activities, currently consisting of 11 programs, represents a major interdisciplinary investment by NSF that reflects the following topical themes: environment, energy and materials, and resilience. The SEES research and education program portfolio emphasizes the use of systems-based approaches to address critical challenges at the nexus of environmental, energy and materials, and economic systems, including social and behavioral dynamics and questions of human resilience and vulnerability. The SEES portfolio seeks to increase capabilities for understanding, predicting, and responding to changes in the linked natural, social, and built environment. Within the above three themes of SEES, NSF supports a variety of new programs that are proceeding down three pathways to advance sustainability: (1) building the knowledge base, (2) growing the workforce of the future, and (3) forging critical partnerships. Through SEES’s goals and themes, proposed linkages and partnerships, and planned future trajectory, scientists can enact targeted plans for ensuring the sustainable future of human society. The research and education communities are strongly encouraged to create interdisciplinary proposals that address aspects of sustainability. Sustainability science, engineering, and education require a multifaceted consideration of the natural environment, human populations, energy and materials use, built environment, and human behavior so that the challenges brought on by large-scale environmental change and modern resource demands—economic, technological, agricultural, and cultural—can be met. NSF’s SEES portfolio transcends basic sustainability research and education through new partnerships and by bridging the gap with societal application and adaptation. Confronting today’s grand challenge of sustainability, NSF’s growing family of SEES programs supports natural and social sciences, engineering, and education, involving every one of NSF’s directorates and offices. To ensure a healthful future, SEES relies on the energetic engagement of research and education communities from AGU and other scientific organizations to help create, nurture, grow, and disseminate the emerging knowledge base on sustainability. Killeen, T., van der pluijm, B., Cavanaugh, M., Eos Transactions, 93, 1-3, 2012. After a 3 year period in the Provost’s Office, Ben van der Pluijm returned to the teaching faculty ranks this Fall. Mostly this means a return to the classroom, since the continuation of his research program was well-supported by the university during these years. PDF Charlie Verdel and research scientist Anja Schleicher anchored a research team that has been focusing on fault rocks in a range of settings, from the US Cordillera to the Appalachians, from the San Andreas fault to the Nankai seismogenic zone. Graduate students Sam Haines and Jim Hnat completed PhDs on Cordilleran normal faults and Southern Appalachian foreland thrusts, respectively, during this period, and new graduate student Tim O’Brien has started his dissertation research on Northern Appalachian faults and foreland diagenesis. Ben will remain involved in a range of university activities, both at U-M and as a consultant-evaluator nationally, while increasingly directing his interests toward the lower-level undergraduate experience. His appointment left little time for geology fieldwork, but he recently returned to the Canadian Rockies to sample fault rocks at major thrusts in the Jasper area. Aided by helicopter, access to key locations was a lot easier than past hikes that would easily take a day for one sample, or were impossible to reach. The picture is a helicopter shot of the most frontal thrust near Hinton, showing spectacular footwall folding and a thin fault gouge layer under the folded carbonate cliff. Getting a sample was tricky, as you can imagine. California's San Andreas fault is notorious for repeatedly generating major earthquakes and for being on the brink of producing the next "big one" in a heavily populated area. But the famously violent fault also has quieter sections, where rocks easily slide against each other without giving rise to damaging quakes. The relatively smooth movement, called creep, happens because the fault creates its own lubricants—slippery clays that form ultra-thin coatings on rock fragments, geologist Ben van der Pluijm and colleagues at the University of Michigan and Germany's Ernst-Moritz-Arndt Universität Institut für Geographie und Geologie report in the July issue of Geology. The question of why some fault zones creep slowly and steadily while others lock for a time and then shift suddenly and violently, spawning earthquakes, has long puzzled scientists. Some have speculated that fluids facilitate slippage, while others have focused on serpentine—a greenish material that can alter to slippery talc. But when van der Pluijm and colleagues analyzed samples of rock from an actively creeping segment that was brought up from a depth of two miles below the surface as part of the San Andreas Fault Observatory at Depth (SAFOD) project (picture), they found very little talc. Instead, they found that fractured rock surfaces were coated with a thin layer of smectitic clay, less than 100 nanometers thick, that acts something like grease on ball bearings. "For a long time, people thought you needed a lot of lubricant for creep to occur," said van der Pluijm, who is the Bruce R. Clark Collegiate Professor of Geology and Professor of the Environment. "What we can show is that you don't really need a lot; it just needs to be in the right place. It's a bit like real estate: location, location, location." The nanocoatings occur on the interfaces of broken-up bits of rock in exactly the places where they affect the fault's "weakness"—how easily it moves. The technique of argon dating provided key evidence, when the researchers determined that these clays, found only in fault rock, formed relatively recently. "The clays are growing in the fault zone, and the fault is coating its own pieces of fragmented rock," van der Pluijm said. "At some point there's enough coating that it begins to drive the behavior of the fault, and creeping kicks in." If the fault is greasing itself, then why do earthquakes still occur? "The problem is that the fault doesn't always move at strands where the coating sits," van der Pluijm said. The San Andreas fault is actually a network of faults, with new strands being added all the time. Because it takes some time for the slick nanocoatings to develop in a new strand, the unlubricated, new strand "gets stuck" for a time and then shifts in a violent spasm. Although the samples obtained through SAFOD are from a depth of only about two miles, van der Pluijm and colleagues think it's likely the clay nanocoatings also are forming and driving fault behavior at greater depths. What's more, analyses of older, inactive strands suggest that the coatings have been facilitating creep for the millions of years of fault activity. The SAFOD project, which is establishing the world's first underground earthquake observatory, is a major research component of EarthScope, an ambitious, $197-million federal program to investigate the forces that shaped the North American continent and the processes controlling earthquakes, volcanoes and other geological activity. HLC evaluates institutions in five major categories: mission and integrity; preparing for the future; student learning and effective teaching; acquisition, discovery and application of knowledge; and engagement and service. In particular, the HLC noted that the university, despite declining state support, has weathered the nation’s financial crisis well, such that academic programs remain strong and the university continues to enhance its reputation as a leader in higher education. It commended the university on its demonstrated commitment to diversity and outreach activities; a participatory governance structure that includes faculty, staff and students; the strength of its central leadership in a decentralized setting; and the quality of its faculty and staff. The final report highlights a range of programs and activities at the university including the multidisciplinary learning and team teaching initiative and the commitment to hire 100 new junior faculty in support of interdisciplinarity; the university’s work to involve students in research, outreach and engagement; and its leadership in economic development in a state hard-hit by the recession. Former Provost Teresa Sullivan, who oversaw the accreditation process, says the extensive self-study that comes with the every-decade review is a chance for the university to examine its current operations, reflect on its goals, and incorporate new ideas and insights into its vision for the future. “The university is grateful to the individuals and groups on campus and across the state who participated in the accreditation discussions,” Sullivan says. “The knowledge the university gained will strengthen and enhance the educational experience of all our students as it informs and shapes plans for programs and activities such as global education, multidisciplinary learning and the evaluation of educational outcomes.” Comprehensive universities of U-M’s size are allowed to choose a special emphasis study to highlight and receive feedback from the commission. The university chose internationalization. “It was very gratifying to see that the Higher Learning Commission was complimentary of our commitment to be a global university,” says Ben van der Pluijm, Bruce R. Clark Collegiate Professor of Geology, who headed the campus reaccreditation process. “And while reviewers praised the many programs we offer to engage students, faculty and staff in international issues and cultures, the commission also has a number of recommendations that will be helpful as we place greater emphasis on internationalization.” Among the suggestions is creating a stronger tie between the myriad international experiences and the curriculum, to offer a central location in support of international activities, and working to achieve more learning across disciplines. A more thorough reaction to and analysis of the report will be forthcoming, van der Pluijm says. I regularly offer presentations or comments for a general public on topics of geology, geohazards and societal resilience. Contact me for information and availability (vdpluijm55@gmail.com). Some example presentations are below. Move aside Holocene: Humans now pushing Earth into new geological era. Click here for podcast. 2009 SAFOD video, click here. "Tiny clays curb big quakes" 2010 press release. A variety of research projects instructural geology and carried out in our group. Brief descriptions of some of these projects are below, as well as links to selected publications. General information on structure and tectonics activities at the University of Michigan are available through the TSG page. Working in young and modern orogens, we examine the geometric, temporal and fluid histories of mountain belts. The work involves varied laboratory components, from low-temperature thermochronology (incl Ar dating) to stable isotope geochemistry to rock magnetism. This integrated approach allows us to unravel the spatio-temporal and fluid evolution of modern mountain ranges (e.g., North American Cordillera). Integrated studies on the formation and mechanical role of clay-bearing fault rock is carried out in collaboration with mineralogist Laurence Warr, Ar geochronologist Chris Hall and stable isotope geochemists John Valley (Wisconsin) and Andreas Mulch (Frankfurt). We are studying mineralogic reactions and transformation, deformation mechanisms, deformation textures, fluid history and dating of ancient clay gouges (currently faults of the North American Cordillera, normal faults in SW US, thrusts in the Pyrenees) and active continental transforms (San Andreas Fault, Alpine fault, North Anatolian Fault). Also we work on textural, chemical, geochronologic and thermo-mechanical modeling studies of pseudotachylyte, which are fault rocks that formed by friction melting. Calcite twinning in coarse-grained limestones and rock magnetic methods are used to determine stress and strain patterns in orogenic fronts and cratonic forelands. We also study the processes of oroclinal bending using rock magnetism, in collaboration with U-M paleomagnetist Rob Van der Voo. Processes associated with the formation of ductile and brittle shear zones, foliations and diagenesis are studied using optical microscopy, electron microbeam (microprobe, SEM, AEM/STEM) and rock magnetic techniques. Aspects of this work are carried out in collaboration with other faculty and researchers. Modern rock magnetic and X-ray techniques, some of which we developed, are used in conjunction with traditional structural analysis to quantify depositional and deformation fabrics. The Department of Earth&Environmental Sciences is well equipped for modern structural/tectonic studies. The distributed structural geology laboratory cluster consists of a workroom and lounge (4534 CCL) with several research optical microscopes, including a Leitz Ortholux with photographic attachment, a dedicated Zeiss U-stage microscope with computer, facilities for real-time, microscope-based deformation experiments of analogs, and map analysis. 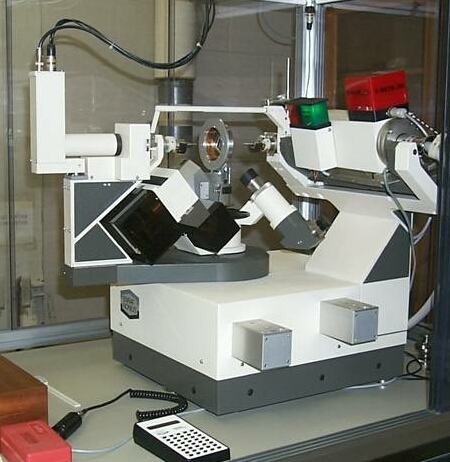 A texture goniometer, using an Enraf-Nonius single-crystal diffractometer, is located in the X-ray Laboratory (2005 CCL; picture), which also houses a state-of-the-art Rigaku diffractometer for quantitative powder sample characterization.Several magnetic fabric devices (including a Kappabridge and SI2 bridges) are housed in the Paleomagnetics Laboratory (4538 CCL) that also offers cryogenic and AF demagnetization capabilities. The Electron Microbeam Analysis Laboratories house multiple TEM/STEM, SEM/FIB-SEM and microprobes for micro-structural and micro-chemical analysis. A dedicated laboratory is equipped with mineral separation and preparation equipment, and includes a Coulter counter (5553 CCL). Shared departmental facilities offer extensive stable and radiogenic isotope capabilities, including Ar chronology, and other geochemical approaches. Technical support is available for all these facilities. More info on ORCID, ResearchedID,	Google Scholar.